K.F Tool V2.0 is a small application for windows computer created by Kurdish GSM, which allows you to perform several functions on your android devices in order to repair or modify them. 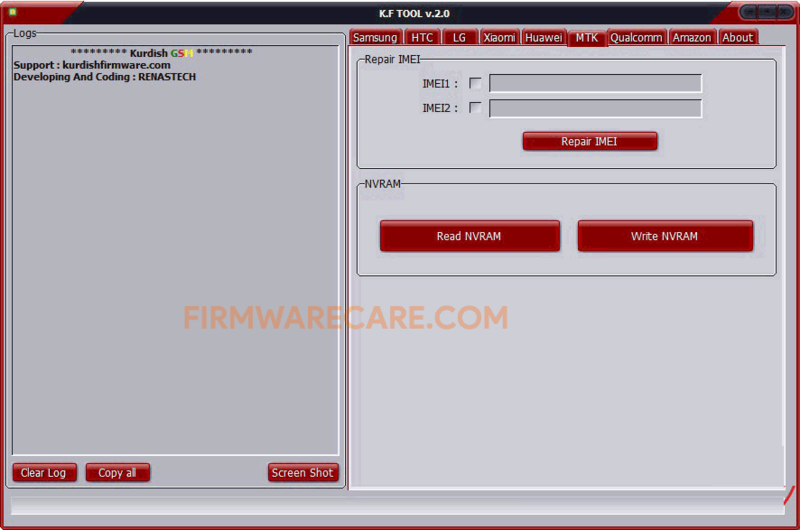 The several features of K.F Tool V2.0 includes remove FRP, repair IMEI, unlock network and many more. K.F Tool V2.0 supports Samsung, HTC, LG, Xiaomi, Huawei, MTK, Qualcomm and Amazon devices. You can track your performed task on log screen. It also allows you to clear log and take screenshot of your log screen with a single click. K.F Tool V2.0 also allows you to read and write NVRAM. Moreover, you can use this tool to unlock Mi account for your Xiaomi device. In order to use the K.F Tool, you need to install the Universal ADB Driver on your computer. [*] Compatibility: The K.F Application runs perfectly on Windows XP, Windows Vista, Windows 7, Windows 8, Windows 8.1 and Windows 10 (32 bit and 64 bit). [*] Credits: K.F Tool is created and distributed by Kurdish GSM (developer). So, full credits goes to Kurdish GSM (developer) for sharing the tool for free.